It is said that if you laid all the bricks from the Piccadilly Theatre in a line, they would stretch from London to Paris. The Piccadilly Theatre is one of the largest theatres in London and has previously operated as a cinema. Productions to have run here include Who’s Afraid of Virginia Woolf, Guys and Dolls and Jailhouse Rock. 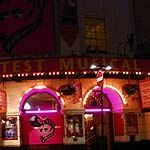 The Piccadilly Theatre is currently host to Grease the Musical. Do you work at Piccadilly Theatre? What did you think of Piccadilly Theatre?